At the beginning of the summer I had every intention of going to an orchard a couple of hours north of Los Angeles to pick some Sour Cherries. I missed the first weekend the orchard was open for picking and sure enough I got an email saying that they were out. Missed chance! I figured my local market would probably bring some in at some point for sale. Much to my sadness every time I went I never saw any Sour Cherries. Then a few weeks back much to my surprise there they were! I purchased them immediately with great plans for them. Then things got in the way and I didn’t get to do what I really wanted to do with them. So in the end I decided that I needed to do something quick with them before it was too late. After consulting with my mom I went to work to make Sour Cherry Preserve! During my conversation with my mom I learned something new that I didn’t know. 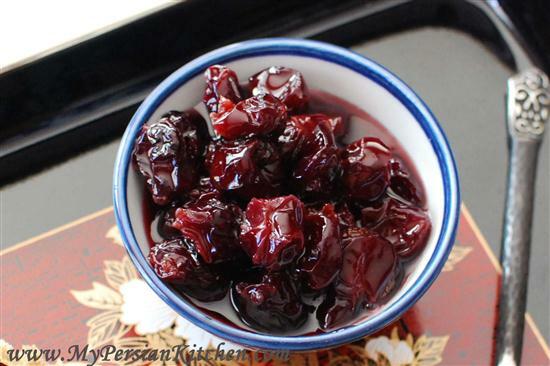 When making preserves or jams fruits’ weight is measured without the pit. Who knew!! But then again, I am not an expert caner, even though I aspire to be one! This preserve was super easy to make and it came out great. I have to give you a little heads up though, the amount of sugar that I used is a bit less than the norm. I didn’t want a super sweet preserve. What I really wanted was for the sour cherries to still have some of their tartness and for the sugar to add a bit of sweetness. Some like to add a bit of vanilla extract to this preserve or pectin. I used neither, I wanted the fruit to speak for itself! 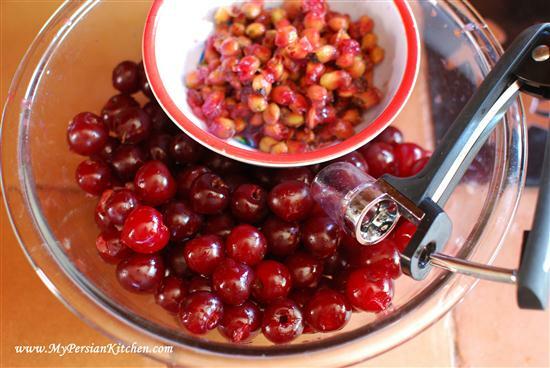 Wash, dry and remove pits from sour cherries. 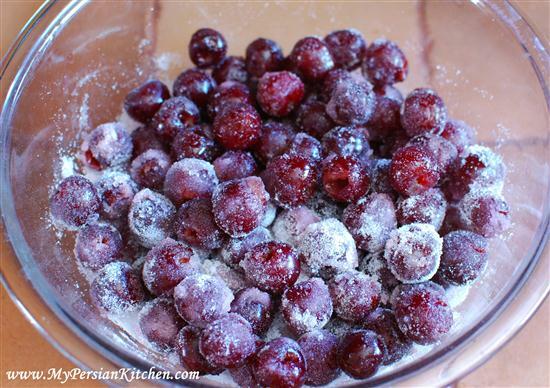 Add sugar to sour cherries and let them sit there for a couple of hours. 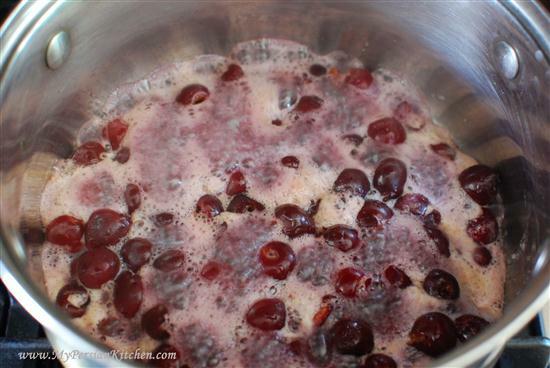 Place fruit and juices in a pot and bring to a simmer. Remove extra foam. Simmer for about an hour until the juices turn into syrup. Sometimes sour cherries have a lot of juice. You have two options if you are left with too much syrup. One option is to remove the actual fruit from the pot and reduce the remaining syrup. The other option is to save the syrup and make Sharbateh Albaloo with your extra syrup!!! My sour cherries didn’t have much juice so I didn’t end up with extra. Once the preserve is ready place in a sterilize jar and keep in the fridge. Since no preservatives are used in this recipe make sure to consume it within a month of two of making. 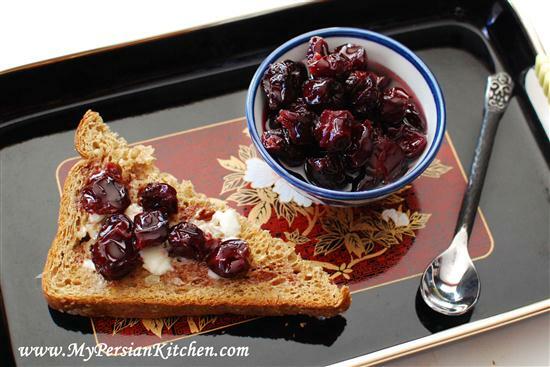 I make a cherry & rice dish with roasted chicken – forgot the persian name- and this looks like it would work great. Looks delicious! My mother-in-law makes a nice preserve with these. I’ve never seen them in the stores here though. Thanks for sharing! Hmmm. An orchard you say? Could you possibly tell me where this delicious place is located? It sounds like a wonderful day trip for the family next summer. I had nice sour cherries sitting in a freezer for a year ! I decided to make jam, but I don’t have scale at home. It is difficult to tell how many cups are equal to how many pounds. Is it possible for you to write the recipes all based on cup? Or at least put in parentheses how many cups it would be?